If you own Intel's mini NUC PC or Compute Stick and find yourself in need of a keyboard and touchpad to interact with your diminutive Windows computer, Intel has a solution. In an odd marriage between Windows and Android, the Intel software, available in the Google Play Store, allows Android users to use their phone's touchscreen as a keyboard or touchpad for their PC. You will need a Windows 8.1 PC, and pairing your phone to your computer is as easy as scanning a QR code once the free Intel Remote Keyboard app is downloaded to an Android smartphone or tablet. The best part is that the software brings gestures to the computing experience. For example, when in mouse mode, users can perform a left click with one finger, a right click with two fingers and a finger slide across the touchscreen to emulate a scrolling motion. The Intel Compute Stick is about the same size of Google's Chromecast. Essentially the size of an HDMI dongle, the Compute Stick plugs into the HDMI port on a monitor, projector or HDTV and brings the full Windows experience to a form factor that's much smaller than a mini PC or traditional desktop. The downside is that if you plug the Compute Stick into your living room TV, for example, you may not always have a keyboard and mouse or trackpad nearby when you need to do computing tasks. The Intel Remote Keyboard Android app makes it easy as most users will always have their phones nearby. 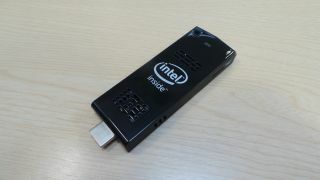 Intel's Compute Stick costs $170 (£107, AU$218). In addition to Intel, other manufacturers, including Foxconn and Lenovo, are exploring smaller PC form factors.